Songs A friend of mine called me crying today. She wanted to thank me for the beautiful CD I had given her and to tell me she loved David Archuleta and his beautiful voice. She went on to say that she was house-cleaning to his music that morning and was so “absolutely moved and touched by him,” that he was in her soul! I love it when I hear that. It is exactly the way I feel. She gets it…no, I take that back, she gets David! I had introduced my friend to David this past Christmas when I gave her his album Christmas from the Heart. She called as soon as she had heard all of it and thanked me over and over. She had not realized what an amazing singer he is. Oh, had she been missing out! Later when I was able to get an extra free ticket to David’s Christmas concert at Foxwoods MGM Grand Theater, I knew I had to bring her with me. We had such a wonderful time that evening hearing David perform live. My friend was absolutely blown away by David and his talent—no surprises there! She loved the performance of one song in particular; it brought her to tears. So when I found shared downloads of the Foxwoods concert, (I was able to get all the performances from the show we had attended in December), I made my dear friend a CD of the concert. The recordings were amazing and such a wonderful memory that we both share. When she called me this morning, I knew exactly what the song was that had again brought her to tears. It does the same thing to me every time I hear it! “Prayer of the Children” was written by Kurt Bestor, an American composer, arranger, and performer, and arranged by Andrea S. Klouse. Bestor wrote the song in the early 1990s, after learning about the civil war that had overtaken Yugoslavia. To him, that war felt personal. “Having lived in this war-torn country back in the late 1970s, I grew to love the people with whom I lived. It didn’t matter to me their ethnic origin – Serbian, Croatian, Bosnian – they were all just happy fun people to me and I counted as friends people from each region. Of course, I was always aware of the bigotry and ethnic differences that bubbled just below the surface, but I always hoped that the peace this rich country enjoyed would continue indefinitely. Obviously that didn’t happen. “When Yugoslavian President Josip Broz Tito died, different political factions jockeyed for position and the inevitable happened – civil war. Suddenly my friends were pitted against each other. Serbian brother wouldn’t talk to Croatian sister-in-law. Bosnian mother disowned Serbian son-in-law and so it went. Meanwhile, all I could do was stay glued to the TV back in the US and sink deeper in a sense of hopelessness. Here is Kurt Bestor singing his song “Prayer of the Children.” The second to last line is sung in Croatian. This is a very powerful video, with many moving and disturbing images. Nonetheless, a very beautiful version by Kurt. Dali čujete sve dječje molitve? 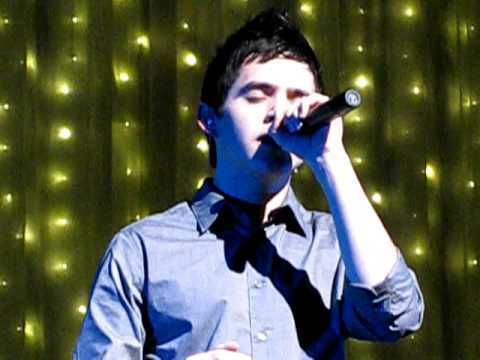 David Archuleta performing “Prayer of the Children” at the Foxwoods MGM, for a Billboard ‘Live’ Show on December 17, 2009. I just listened to all the renditions of “Prayer of the Children” posted here. They are absolutely beautiful, all of them. Thank you so much. Once again I am amazed at how far David’s beautiful and soulful voice reaches… from you to your friend to many other countries… uplifting everyone in so many different ways. And your video collection this year really did reach many of those places. Thanks. I enjoyed hearing this song again. David is such a wonderful person and I am so glad that I know of him.